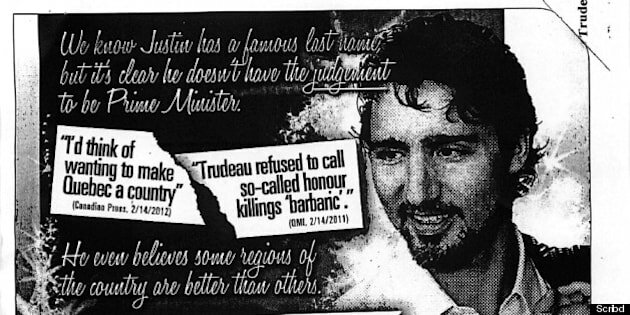 OTTAWA - A growing number of Conservative MPs say they won't mail their constituents the party's latest attack on Justin Trudeau, saying the negative, taxpayer-funded pamphlet is just not their style. Tories received a sample of the flyer about the Liberal leader last week, designed by the party's parliamentary research group. It matches recent television spots about Trudeau that say he lacks the experience and judgment to govern. Unlike the TV ads, the mailout (called a "ten-percenter") is funded by the taxpayer through House of Commons budgets. Several Conservatives from across the country said Tuesday they won't use it. "I haven't sent out an attack ten-percenter for over four years," said Edmonton Tory MP Laurie Hawn. "It's just not my style." "I don't feel it's appropriate for me to do it," said Joe Daniel, a Toronto Conservative MP. Some MPs told The Canadian Press they've been hearing complaints from constituents on the issue. Ontario MP Larry Miller said a voter told him he didn't like it when former Liberal prime minister Paul Martin attacked Stephen Harper, and doesn't like what the Conservatives are doing now. "I don't participate in criticizing anybody else. I like to talk about me," said Miller. "I don't like negative advertising, I don't use it, and that old saying — I control what I can control. I've voiced my opinion on it, I don't like it," he added. Said Alberta MP Kevin Sorenson: "I don't use that type of householder. I haven't heard from anyone who's going to either." Fellow Albertan Mike Lake said he rarely sends out the flyers, and when he does it's for a practical purpose. "I generally use them for things like advertising our pancake breakfast or our Christmas open house and maybe some of the other things I'm trying to communicate to my constituents," said Lake. Other Conservatives who have recently said they won't be using the material include New Brunswick's Mike Allen, Stephen Woodworth of Ontario and Brent Rathgeber of Alberta. Trudeau took note of the Conservatives who are refusing to participate in the mail-out. "It is a little egregious that these negative, malicious attacks come on the public dime, and that's why members of the prime minister's own caucus are disassociating themselves from this tactic," he said. The break from the official message is the latest example of Conservative MPs asserting their autonomy from the party brass. On Tuesday, Tory MP Leon Benoit put an unscheduled question to his government during question period about how it is protecting the environment around pipeline projects. Many MPs have been supporting the concept of more freedom of speech for parliamentarians in the Commons. Tories from Saskatchewan recently complained that party headquarters had given them poor advice on how to respond to a redistribution of seats in the riding. Rathgeber, one of the most outspoken MPs, says he has resisted attempts by staff at the prime minister's office to vet the content of his personal blog.